Real estate professionals understand that there is an imbalance between supply and demand in most markets across the U.S. Buyers have been highly motivated by a variety of factors ranging from low (but rising) interest rates, job growth, rising rents, general optimism and other dynamics. Seller activity, however, has been more restrained—though there’s some evidence that’s starting to change. 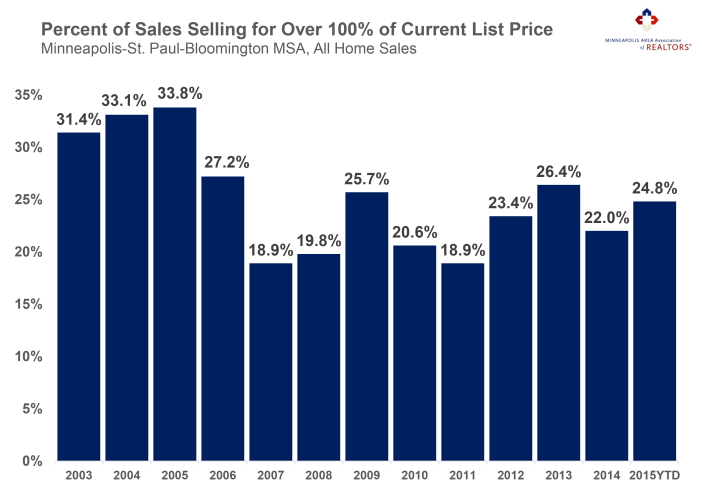 In the Twin Cities, that imbalance between supply and demand has driven down absorption rates. With 3.6 months supply of inventory (5-6 is considered “balanced”), our market is still tilting toward sellers. In other words, low inventory combined with strong demand means many sellers are receiving multiple offers on well-priced and well-presented listings. Buyers are essentially competing with each other in order to purchase the limited number of desirable homes on the market. It’s a regional bidding war: as buyers vie against one another, they may offer more than the list price of the home in order to win the day. That means sellers are sometimes yielding over 100 percent of their list price. It’s a dream-come-true for sellers. Now it just has to appraise! In 2005, a full 33.8 percent of all closed sales sold for over 100 percent of the current list price. That’s over 1 in 3 sellers receiving more than their asking price. That figure fell to 18.9 percent as the market crash began in 2007, and it touched that low again in 2011. By 2013—a very strong recovery year—the figure had increased to 26.4 percent. After falling again to 22.0 percent of all sales in 2014, the number of homes that sold above list price has increased to 24.8 percent so far in 2015. With the second half of 2015 yet to be recorded, it’s possible we will end the year near 2013 levels, particularly as buyers face the looming risk of rising interest rates combined with climbing rents and an improving labor market. Ultimately, a healthy and sustainable housing market should be well-balanced between sellers and buyers, supply and demand. A healthy market means relative equilibrium, one that favors neither buyers nor sellers, but allows for both sides of the transaction to successfully reach their goals. A healthy market means sellers are enjoying some appreciation but home prices aren’t dramatically outpacing incomes. After about a decade of lurching between boom and bust, the Twin Cities housing market as well as others across the nation finally seem to be settling into a healthy groove—for the time being.